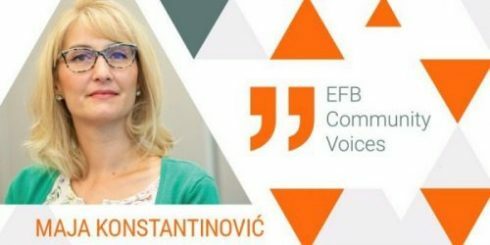 My name is Maja Konstantinovic and I was granted a EFB fellowship, which offered me the unique opportunity to spend three months in Rome working in the Ministry of Education, University and Research in the department managing the European Union structural funds. Countries that are not members of the EU are not allowed to use EU structural funds but pre-accession assistance, which is some kind of preparation for more efficient usage of structural funds once they join the EU. Therefore this excellent experience gave me the opportunity to further foster my knowledge and obtain a broader picture of the framework of institutions involved in the structural funds management as well as to learn about the organisational structure and the concrete tasks of one Managing Authority. The Ministry implements projects in the field of improving students’ competencies, the professional development of teachers, decreasing the school dropout rate, making schools smarter, eco-friendly and equipped with cutting-edge IT equipment. My first impression was the existence of complex and efficient information systems that immensely contribute to successful project management, prevention of mistakes and potential irregularities and also significantly decrease employees’ workload. The second impression was the way the employees communicate with the project beneficiaries: schools, students and citizens. They really make an effort to help them and in return they get favourable feedback which makes them personally fulfilled. The ministry is placed in one of the most beautiful parts of Rome, called Trastevere and the mere fact that besides work I could enjoy exploring this and other parts of the city made me feel very lucky. The city for me was an enticing medley of historic landmarks, romantic alleys, scents of orange trees, autumn rain and freshly baked pizza, ice-cream flavours and noises of car and scooter honks. I visited many museums, galleries and churches but the most memorable ones were Bernini’s intricate marble statues in the Borghese Gallery, paintings of the renowned painters in the privately owned Doria Pamphlij Gallery, layers of history and mosaics of San Clemente Basillica and the labyrinthine Vatican corridors. I also experienced the metropolitan side of the city and learned first-hand a few lessons on intercultural communication with my fellow students from Malawi, Turkey and Canada in an Italian language school. Warm friendships that I developed with my roommate from Macedonia and other EFB fellows during the introductory and final seminar added value to my overall experience, which was at times delightful, challenging, with a touch of homesickness but on the whole unforgettable!